I've been wanting to write a post called "How I Teach... Geometry Proofs" for a long, long time. I've written several drafts, but it always seemed like a jumbled mess. So, I thought it lent itself better to a list. So for those of you that faithfully read my "How I Teach..." posts, this one's for you! Scaffold, scaffold, scaffold. When I first start showing my students proofs, I ALWAYS do two-column proofs with the statements completely filled in; I only make my students supply the reasons. As we progress through the semester, I start leaving blanks and have my students start supplying some of the statements too. For on level geometry, I stop there. 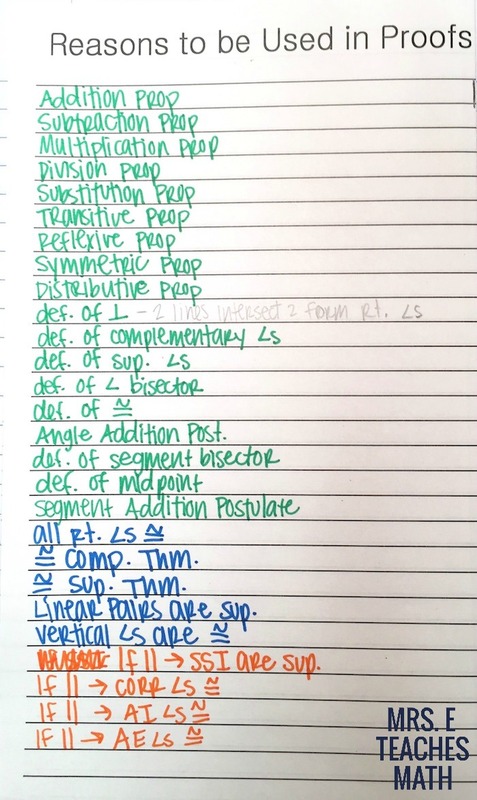 For honors geometry, I start leaving all of the statements and reasons blank, but give blanks so my students know how many steps are typically needed. Then, (depending on the students) I have them write proofs from scratch with no guidance. Make students keep a Proof Reasons List. Some years I have done this, and some years I haven't. It helps SO much. I have students list the reasons and I expect them to write off to the side something that will help them remember when to use it. 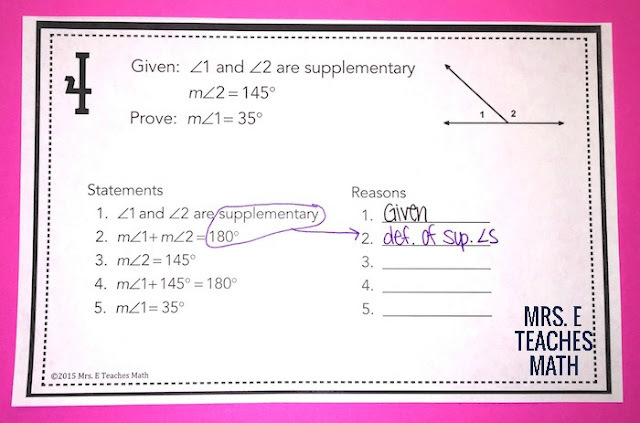 Sometimes, I have even given students a couple extra points for making flashcards out of their proof reasons. Do activities with proofs. 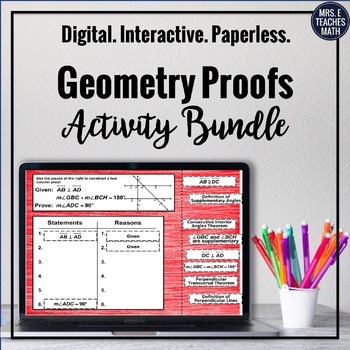 Kids think proofs are boring. Make it bearable by doing activities. 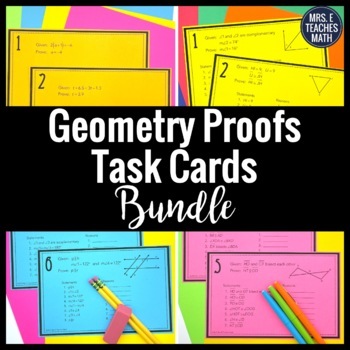 My favorites are using my proofs task cards to do speed mathing or stations or doing proof cut out activities. 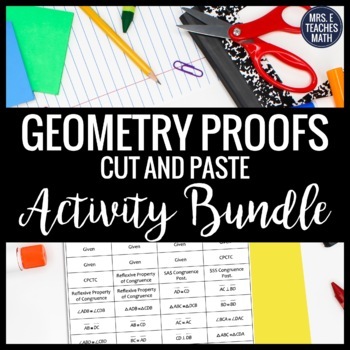 I have a post about teaching with proof cut out activities too. Always fill in the given information first. I can't tell you how many times I've seen kids working on proofs and get stuck on a step when the information is given. In fact, when I work proofs on the board, I fill in the given information in black, and then complete the rest of the proof in another color. 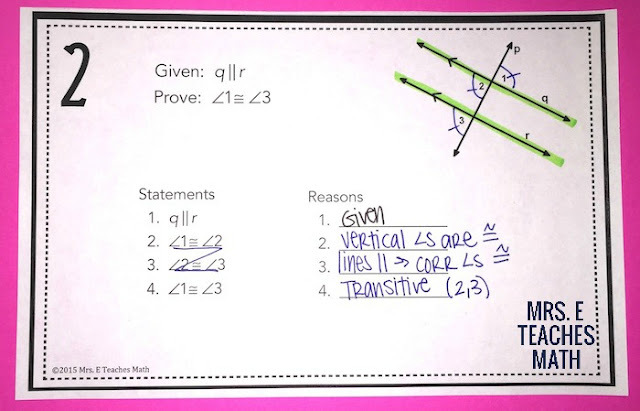 When I do this, I'm trying to help students visually see the given information as separate from the rest of the proof. Let students abbreviate. Some proofs are longgg. I try to let students abbreviate when it makes sense. I allow my students to abbreviate the same way I do in class. For instance, I let them write "<s" instead of "angles". I do NOT allow my students to abbreviate substitution, because it looks too much like subtraction. Have students write out theorems. 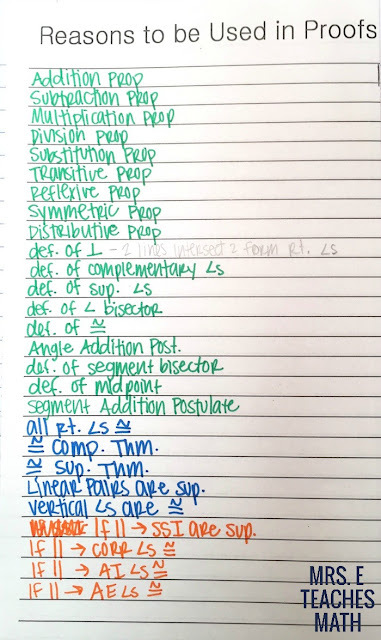 My first couple years of teaching geometry, I only had students reference the theorem names when writing proofs. Proofs seemed so abstract to them and they had no idea what the theorems actually said. Now, I have students write out what the theorem actually says (where feasible). My students may not know the exact name of every theorem in the textbook, but they know what they mean, which is way more important. 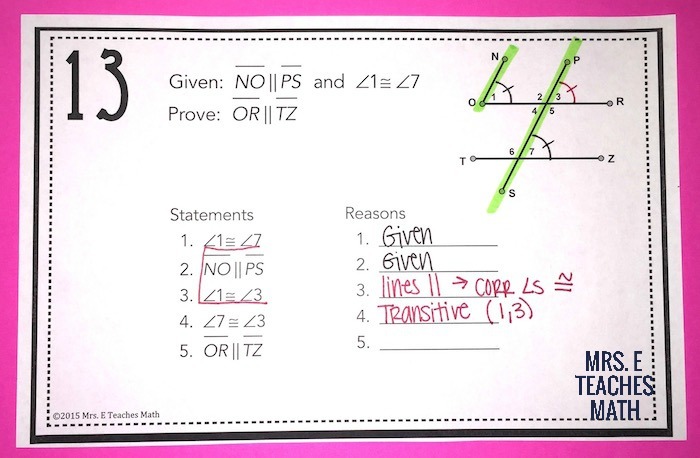 Along with the abbreviation, a typical parallel lines proof could look like the proof below. Highlight pairs of parallel lines. Some of my students have so much trouble visualizing! Highlighting helps the pairs of lines stand out. When using the Substitution Property or Transitive Property, write the line numbers of the statements you are using. Students often have a hard time seeing how everything fits together when they are looking at a completed proof. In the proof below, the reason for step 4 is the Transitive Property. I have also written on the line (1,3) because steps 1 and 3 are used. Circle words that have definitions. I often find myself circling words like complementary and supplementary to show kids the definitions within the proofs. For instance, in the proof below, I would circle supplementary and 180 so that kids would see that they go together. I often draw an arrow to the blank that supports the definition. Require that students mark the diagrams. I make my students mark the diagram for every proof, no matter how short. They should mark the proof as they go through it, so it should be very marked up when they are done. If information is given in the diagram, I even tell them to trace over it with their pencil. Sometimes completed proofs look messy. I don't care. 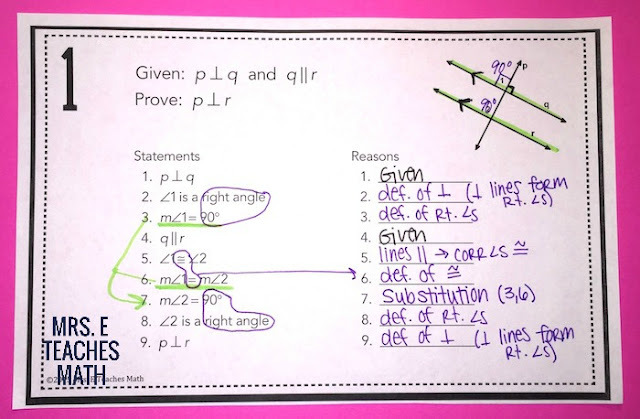 Do you have any tips for helping students write proofs? Leave them in the comments! I would also cut out proofs into each step --statement separate from reason. Then groups of students would assemble the statements and reasons into a 2 column proof. I have several activities where I do that too! It's so helpful for them to be able to move the pieces around without fear of erasing and being wrong. Those are great tips! I love the outlining the triangles in color. I'm going to show that to my students tomorrow! When looking for parallel lines I have my students look for the "Z-knees". If you can make a Z with the top and bottom as the 2 parallel lines (transversal as the diagonal) the angles in the "knee" part are the alternate interior angles. Thank you everyone for the great ideas. When I teach overlapping triangle proofs, I have my students redraw the triangles apart form each other. 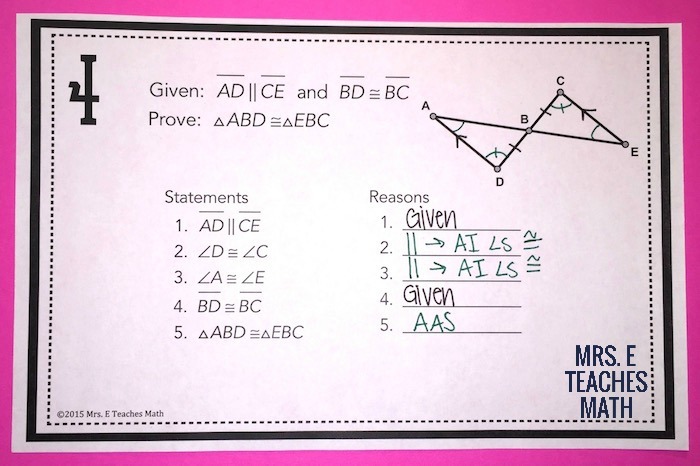 Depending on the proof, one strategy I tell my scholars is to highlight what they are trying to prove (especially if it's something like proving two sides are congruent AFTER proving the triangles are congruent). So they know what they are "aiming" for. I'm a first year geometry teacher. 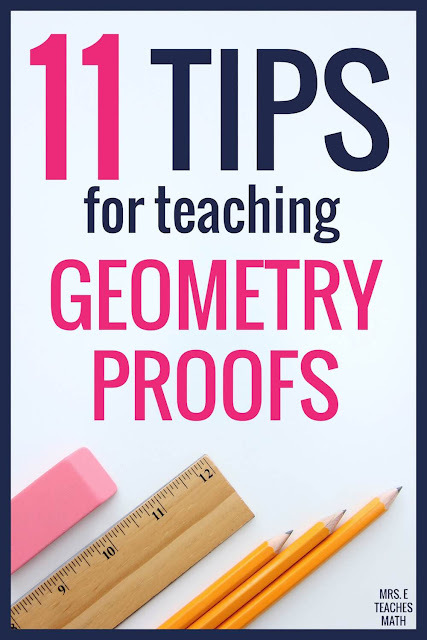 I have been dreading geometric proofs, but I can't avoid it at this point and this post was GREAT!!! I am going to use every tip you suggested and then some. Thank you for this.